• beneficial for children with functional disorders (diarrhea, constipation, flatulence, irritable bowel syndrome). Probiotics are live bacteria that help maintain a normal balance of microflora. The normal human digestive tract contains about 400 types of probiotics that reduce the growth of harmful bacteria and promote a healthy digestive system. The largest group of probiotics in the intestine is lactic acid bacteria. 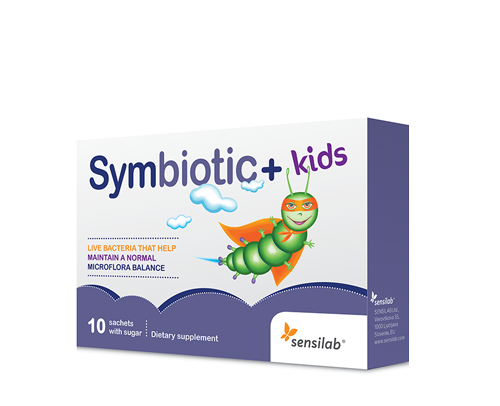 Symbiotic+ kids is a combination of Saccharomyces boulardii, Lactobacillus rhamnosus GG, and inulin that has a beneficial effect on digestion and helps maintain a healthy intestinal flora. Suitable for children from age 3 and above. Use: Recommended daily intake: for children: 1 sachet, dissolved in a glass of water, best during a meal; for adults: 1-2 sachets, dissolved in a glass of water, best during a meal. Active ingredients in 1 sachet: live lyophilized bacteria cells of the Lactobacillus rhamnosus GG strain 3 x 109 CFU, live lyophilized yeast cells of the Saccharomyces boulardii strain 1.25 x 109 CFU, inulin 25 mg.